It’s sad really. 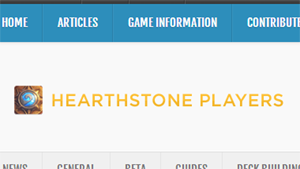 HearthstonePlayers.com will be closing it’s shiny doors sometime soon. Liam, the guy managing the site, is moving on to work for ManaGrind and the guy who owns the site isn’t interested in keeping it open right now. So really soon now, the site will come down. I wanted to keep the stuff that I wrote over there (at least the good stuff) online, so I copied it over here. You’ll notice everything is in reverse order. Sorry about that. I copied it most recent first and posting the oldest, last. So that makes it look first on this blog. Friday’s stream of The Arena (formerly known as The Forge) showed us that the current Hearthstone build isn’t quite ready for prime time. It’s getting there but there were a few graphical glitches that stood out. The biggest issue was the server disconnect that took a lot of the scheduled play time to fix. It looks like the Hearthstone beta isn’t quite as imminent as I thought it was. So what can we do while we wait? One thing that many people are doing is posting threads on the official forums asking and trying to pressure Blizzard into starting the beta. Bad people! The blues at Blizzard have enough on their hands without having to read that all day long. I’d like to discourage that behavior and suggest a few alternatives. There are still eight weeks of summer left. That’s plenty of time to take a cool Hearthstone related road trip. But where to go? There’s Hearthstone Castle in Danbury, CT. It was listed on the National Register of Historical places in 1987 but has since been closed to the public due to safety. The pictures of the castle look really cool. It’d be nice if someone could renovate this place and re-open it. If you’re in the Midwest there’s the Hearthstone Coffeehouse and Pub in Fishers, IN, just outside Indianapolis. And of course there’s the Hearthstone Lodge in northern Idaho. Although it looks like Ben Brode got there first. There are dozens of examples of people sculpting hearthstones on the internet forjewelry, key-chains, custom soaps, and phone charms. Here is a video showing how one person sculpts theirs out of polymer clay. It seems like there are even more examples of cooking hearthstone style on the interwebs. Cookies, cakes, and cinnamon rolls to name a few. Here’s Rosanna Pansino and WowCrendor on the Nerdy Nummies YouTube channel making Hearthstone candies. Pillows, sewn, crocheted, knitted, it doesn’t matter. 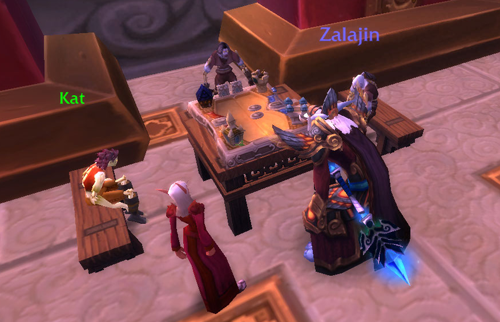 If needlework is your thing there are many ways to make your own hearthstone. I’d love to see someone do the whole hearthstone box as a pillow. Finally, if you haven’t opted in for the beta lottery you can still do so. Just follow the instructions here. As you can see there are plenty of things to keep you busy while we wait for the beta release. There’s no need spam the forums. If you know of a cool Hearthstone related place to visit, or a recipe, or craft that I haven’t mentioned please let us know in the comments. The Paladin deck in Hearthstone is one of the most forgiving, easy to learn and play decks in the game. I usually recommend it to new players for their first deck. That doesn’t mean it’s a pushover later in the game. It’s assortment of healing, secrets, weapons, buffing, and powerful minions makes it a difficult deck to defeat. The following is a strategy that can be used to successfully play the paladin deck. It is written for the beginning of game play when you don’t have many epic or legendary cards. However, many of the ideas presented should carry over into the later stages of your gaming experience. I’ve also listed some epic and legendary cards that will help out so you can be on the look out for them. The paladin hero has many strong tools to damage the opponent and other abilities to limit the opponent’s use of his own tools. This is pretty self explanatory. Heal yourself so that you survive until the end game. Use your hero power and healing minions. Along the way take out the opponents taunters and other minions. Do damage to the opponent’s hero if you can. Don’t let the opponent get too many minions or you’ll be overrun. Tanks protect the adventurers in World of Warcraft by keeping the boss attacking themselves instead of the party members. In Hearthstone that function is provided by taunt minions. As long as you have taunt minions on the board you are relatively safe from attack. There are some exceptions to this of course. Some spells and minions can bypass taunt minions. A good rule of thumb is to keep a taunt minion up as much as possible. This tactic baits the opponent into spending precious resources on something that isn’t important to your plan. Play a card that looks dangerous that your opponent will want to remove from the board. Dropping a Core Hound is a good example. At 9/5 your opponent can’t afford to leave that on the table or they will take 9 damage somewhere during the next turn. They pretty much have to remove it and in doing so will spend resources that they could have been using to kill your hero. Card Starvation happens when you play all of the cards in your hand and the only cards you have left to play are those you are dealt at the beginning of your turn. It’s also called playing off the top of the deck. This is a bad thing because your options are limited by whatever the next card is. It would be better to have a selection of cards in your hand to pick from. To prevent this problem we put cards in our deck that cause us to draw more cards. Loot Hoarder and Divine Favor are good examples of these kind of cards. We can’t quite Bubble – Hearth like in Wow, but the Paladin can bubble his minions. The Argent Protector, for instance, can bubble a friendly minion while Hand of Protection is a spell that does the same thing. The paladin has a couple of methods to keep his health up there. Holy Light costs 2 mana crystals and restores 6 health. Guardian of Kings gives you a 5/6 minion and heals your hero for 6 health. Lay on Hands heals you for 8 and costs 8 mana. Paladins are one of the few classes that gets to use weapons in Hearthstone. Light’s Justice is cheap and does 1 damage with 4 durability. That means it can be used 4 times before it becomes destroyed. The Truesilver Champion does 4 damage and it heals you for 2 heath, but only has a 2 durability. The Sword of Justice doesn’t hit for much but it has the ability to add +1/+1 to each summoned minion. Every minion reduces it’s durability by 1. Finally, the Ashbringer isn’t a usual weapon. You gain it’s use when the legendary card Tirion Fordring dies. This tactic allows you to lower a stat on your opponent’s minion. For instanceEquality takes all minions health to 1 hp. The Aldor Peacekeeper and Humilityreduce the Attack Power of your opponents minion to 1. Paladins get to play secrets. Secrets are actions that are hidden from your opponent which only trigger under certain conditions. For instance, when you are attacked Noble Sacrifice summons an new target for the attack. When you are damaged Eye For An Eye reflects that damage on your opponent. Equality changes ALL minions health (Yours included) to 1 hp. Follow that up withConsecration for a total board wipe. Obviously this is only good at certain times. You wouldn’t want to play this when you have a lot of minions on the board. Who wouldn’t want Tirion Fordring in their deck just for the chance to wield theAshbringer (5/3)! And neutral minions to fill in where the paladin deck is weak. Fill the rest of the deck with cards needed for the tactics you want to concentrate on. Think mana curve when building your deck – not only ramping up, but what you can cast together with 5-10 mana. Take your time. Having two copies isn’t always the best solution, if they don’t fit. You probably now have way more than the 30 cards allowed in the Hearthstone deck. Have a tactic that I missed? Have more deck building advice? Please share it with us in the comment section below. Our ol’ buddy Rexxar is quite the hero. He saved Orgrimmar and the Horde over and over again before settling down with his faithful pet bear Misha at Thunderlord Stronghold in the Blades Edge Mountains. In fact he’s the perfect hero to represent hunters in Hearthstone. The Hunter deck in Hearthstone is one of the easiest to learn and play in the game. I recommend it to new players for their first deck outside of the mage of course. That does not mean that Hunters are a pushover later in the game. It’s assortment of skills makes it a difficult deck to defeat. The following is a strategy that can be used to successfully play the hunter deck. It is written for the beginning of game play when you don’t have many epic or legendary cards. However, many of the ideas presented should carry over into the later stages of your gaming experience. I’ve also listed some epic and legendary cards that will help out later on so you can be on the look out for them. Rexxar has many strong tools to damage the opponent and the strong synergy between hunters and beasts makes him extremely powerful. Tactics are the things you do to achieve the overall strategy. This first group of tactics are general in nature and apply to all classes. This is pretty self explanatory. Use minions that heal so that you can survive longer. Along the way take out the opponents taunters and other minions. Do damage to the opponent’s hero if you can. Don’t let the opponent get too many minions or you’ll be overrun. Tanks protect the adventurers in World of Warcraft by keeping the bosses attention on them instead of the party members. In Hearthstone that function is provided by taunt minions. As long as you have taunt minions on the board your hero and other minion are relatively safe from attack. There are some exceptions to this of course. Some spells and minions can bypass taunt minions. A good rule of thumb is to keep a taunt minion up as much as possible. This tactic baits the opponent into spending precious resources on something that isn’t important to your plan. Play a card that looks dangerous so that your opponent will want to remove from the board. Being able to get rid of an annoying ability or that taunter that is in your way is incredibly helpful. If you don’t have an ability that Silences or Dispels a minion keep a couple of minions in your deck that do. The Ironbeak Owl comes to mind right off the bat and is a beast so it works well with hunters. Actually it works well in any deck. Now on to the Hunter specific tactics. Hunters get to play secrets. Secrets are actions that are hidden from your opponent which only trigger under certain conditions. For instance, if your opponent plays a minion card Snipe automatically deals 4 damage to it. When you’ve played Misdirection, if an enemy attacks your hero the attack will instead hit another random target. It could be your opponent’s or yours. There are a few other traps. I’ll let you discover how much fun they are. Hunter’s have two weapon that they can wield (at the time that I’m writing this). The Eaglehorn Bow has 3 attack and 2 durability but whenever a secret is revealed it get’s +1 durability. The Gladiator’s Longbow has 5 attack and 2 durability for a cost of 7 mana. It makes your hero immune when attacking. Which is especially handy when dealing with really large attack power minions. It’s epic though so it will be difficult to come by. The synergy between hunters and beasts is so strong that many deck building guides just flat out say try to get the cards listed below. If you don’t have a card that is listed just fill in with any beast until you can get the card in question. A lot of the beast buff other beasts and a few of the hunter’s abilities either help beasts or do more damage when the hunter controls other beasts. TL:DR = Get Moar Beasts! The hunter hero power is Steady Shot. It does 2 damage to your opponent’s hero, bypassing taunt, etc. Unfortunately you can’t use it against minions. It’s really easy to forget to use your hero power. So remember it. Take your time. Having two copies is not always the best solution if they don’t fit. Here’s an example of a Hunter Aggro/Control Deck. I’ve used a variation of it for a while now and have done really well with it. The deck does list some epic cards that are going to be difficult to obtain at first. But that’s alright, just fill in the cards that you don’t have with other beast minions. You’ll do fine. You can always put the cards into the deck as you earn or craft them later on. Here’s another example of a Hunter Control Deck. I haven’t tried this one yet (mainly because I don’t have most of the cards yet), but it looks interesting. One night, before the big account wipe, I was trying to get the Warlock Dominance daily quest finished. It had you win five matches with that deck. I don’t usually play Gul’dan (I usually play the Hunter or Pally) so I hadn’t built the deck up much. But over the course of the evening I’d been able to piece together 4 out of 5 wins. I just needed one more win to get the 60 gold. Then I could buy another pack of cards. So the matchmaker spins and finds me a worthy opponent, akamikeb, who I remember from watching Legendary over on Gamebreaker.tv and has recently been doing the Hearthstoned videos. So we fought for two matches. The first was my lock against his priest. The second was against his rogue. To my surprise he recorded it for an episode of Hearthstoned. The video is pretty cool. You get to hear what Mike is thinking during the game and his commentary is always fun and entertaining. So here it is Hearthstoned, Episode #12 where I lost one and won one against MikeB. … and I FINALLY finished the Warlock Dominance quest. I just had this happen to me (/facepalm). I figured I’d highlight it since it made my head spin when it hit me. It’s an incredibly great Warrior combo if you can piece it together. I’ll set the scene. It’s the end game. I’m playing Rexxar and am just about out of cards. My opponent, Garrosh, has been holding on to some cards the whole game and drawing things out. He’s obviously waiting to set something up. I don’t remember the specifics as far as what card was played when, but it took two turns and he ended up with this on the board. That’s 5 cards for a total of 15 mana. I only had two tiny cards on the board (probably not the ones in the picture, I can’t remember exactly what they were) and was playing off the top of the deck. Yeah I know, I need more draw cards, or I shouldn’t have played so many early on. But I digress, that’s not the point of this article. I wish I had taken a screenshot of it. I didn’t, but I’ll recreate the board with HSDeck’s puzzle generator. THEN he drops a Whirlwind doing 1 damage to every card on the board. Gurubashi Berserker takes one damage and enrages going to 5/6. Amani Berserkers each take 1 damage and enrage, each of them going to 5/2. The Frothing Berserkers gain 1 attack for each minion that was damaged. The warrior had 5 minions damaged and I had 2 minions that took damage, for 7 total. So each of the Frothing Berserkers went up to 9/3. 5 + 5 +5 +9 + 9 = 33 damage incoming. Needless to say I was a crater in a matter of seconds. Well played Garrosh, well played. Have you seen any really great combos during your play? Let us know about them in the comments below. Special thanks to HSDeck.com for the awesome Hearthstone puzzle generator that allowed me to reconstruct this combo from memory.